Julio Iglesias was born in Madrid, at 2 p.m. on September 23rd, 1943 at the old maternity hospital on Meson de Paredes Street. He is the oldest son of Dr. Julio Iglesias Puga and Maria Del Rosario de la Cueva y Perignat. He shared his childhood with his brother Carlos. On his father's side, Julio's ancestors came from Galicia. His father, Dr. Iglesias Puga, was born in Orense. And Julio's paternal grandparents were Manuela and Ulpiano. On his mother's side, his grandfather was Jose de la Cueva, a famous Andalusian journalist, and his grandmother was Dolores de Perignat Orejuela de Camporedondo. Julio Iglesias was a remarkable athlete, and he played goalkeeper for the junior Real Madrid soccer team. He wanted to be a professional soccer player, but he never abandoned his studies. He studied Law in the Complutense University of Madrid. When he was 20 years old, on the night of Sept 22nd, 1963, while he was returning from Majadahonda to Madrid about two o'clock in the morning with some friends, specifically Enrique Clemente Criado, Tito Arroyo and Pedro Luis Iglesias, he suffered a very severe auto accident which left him semi-paralyzed more than a year and a half. The hope that he would walk again was very slight. The nurse who took care of him (Eladio Magdaleno) gave him a guitar. Julio spent hours listening to the radio and writing poems. They were sad, romantic verses that questioned man's mission in life. Never did he think of becoming a singer. He began to sing to alleviate the nostalgia of having been an athlete who now was prostrate in a bed. He was learning to play the guitar, basic chords to dress his poems with music. His personal force, his will to live, and the great support of his family, especially of his father, who even abandoned his profession during more than a year to help his son's rehabilitation, produced a true miracle: Julio began to walk again. It was many months of very difficult recuperation on the beaches of La Carihuela in Torremolinos (Malaga) and Benidorm (Alicante) from the very early hours of the morning, accompanied by his father. Once he recovered, he resumed his studies and he travelled to England to study English, first in Ramsgate and then at Bell's Language School in Cambridge. Some weekends he would sing in a pub, the "Airport Pub", songs that were popular at that time ? songs of Tom Jones, Engelbert Humperdinck, The Beatles...- And it was there, in Cambridge, where he met Gwendolyne Bollore, who would become his girlfriend, and who inspired one of his most famous songs: Gwendolyne. Julio continued writing songs, and one day he decided to go to a record company to offer one of his songs to be interpreted by one of their singers. The manager, after listening to a single recorded by Julio with only his guitar, asked him ?Why don?t you sing it yourself? Julio answered "Because I am not a singer". Finally they convinced him, and he performed at the then famous Benidorm Music Festival. On July 17th, 1968 he was proclaimed the winner of the contest with his famous song La vida sigue igual, and he signed a contract with Columbia Discos. In February of 1969 he participated in the Brassow Golden Stag Festival (Romania). During this year, he did his first American tour, singing in the Festival de ViÃ±a del Mar (Chile), and recorded his first movie: La vida sigue igual. Julio married, on January 20th, 1971, in Toledo (Spain), Isabel Preysler Arrastria (Manila, February 18th,1951), spending their honeymoon on Gran Canaria (Canary Islands). They have three children: "Chabeli" MarÃ­a Isabel (Aug 1st, 1971, Estoril), Julio JosÃ© (Feb.25th, 1973, Madrid) and Enrique Miguel (May 8th, 1975, Madrid). They were separated in 1978, and they divorced one year later. He participated in the EUROVISION Song Festival, and in many others; meanwhile he was number one on all the worlds? lists, from Mexico to Argentina and from Spain to Japan. He recorded his song Como el Ã¡lamo al camino in Japanese ("ANATAMO URAMO") in 1971. The next year he recorded his first German LP. In 1975 he recorded his first LP in Portuguese. He signed a contract in 1978 with CBS International, and recorded his first album in French, and in Italian. He was invited to judge the Miss Universe contest in Australia in 1979. In Paris in 1983, Julio Iglesias received the first and only Diamond Record Award ever given to a singer by the Guinness Book of World Records for selling more records in more languages than any other musical artist in history (Spanish, German, English, French, Italian, Portuguese, Tagalog and Japanese). In 1985 he became one of the few Hispanic artists to be honored with a star on the Hollywood Walk of Fame. This star is situated on the southern part of Hollywood Boulevard, between Orange Street and Sycamore Street. He also received an affectionate tribute from Miami residents, the city in which he resided, granting him a place of honor on the legendary Walk of Latin Stars on Miami's 8th Street (Calle Ocho). In 1988, he received the Grammy AwardÂ® for Best Latin Singer of the Year 1987 for his album Un hombre solo, and from Aplauso'92 the award of Artist of the Year. In 1992, he was named "Universal Spaniard" in Florida, and in Spain "Ambassador of Galicia" to the world. In 1997 he received the Monaco World Music Award for the best Latin singer, and he has been the first foreign artist in the history of China to receive the prestigious Golden Record Award in 1995. 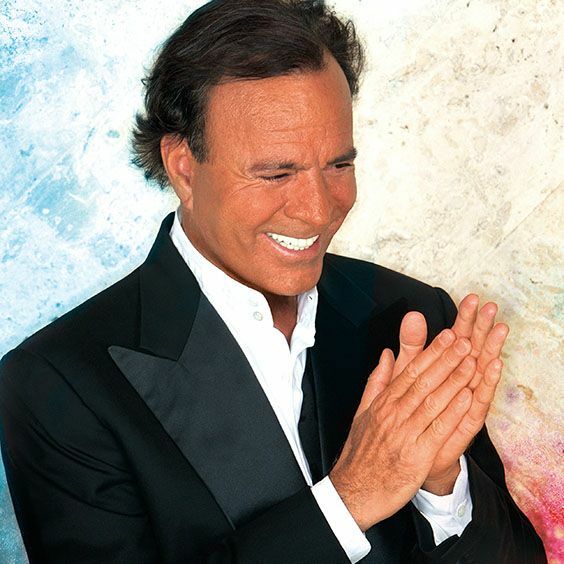 Julio Iglesias is the most popular recording artist in the world. He has sold more than 250 million albums, and has been the recipient of more than 2600 Platinum and Gold records in his illustrious musical career, a figure that no other singer has ever managed to achieve in the history of music. No detail of his career is too small to escape his scrutiny. In the recording studio, Julio crafts each song note by note, studies each word, until he reaches the effect he wants. Until he hears something that perhaps only Julio can hear but that everyone can feel: the sound of the soul trembling with feeling, a sound achieved only through an iron discipline. On September 7th, 1997, his third son, Miguel Alejandro (Michael Alexander) was born in Miami Beach. The baby weighed 7 pounds 10 ounces, and he was the first child of his relationship with Miranda (Miranda Johanna Maria Rijnsburger, (October 5th,1965, Leimuiden), a beautiful Dutch model whom he met in Jakarta (Indonesia) on Dec. 5th, 1990. Julio won't easily forget September 8th, 1997, the night of the "ASCAP Awards". On that night Latin pop producer/songwriter Emilio Estefan presented Julio with the ASCAP Pied Piper Award, the Society's most prestigious award for entertainers. As the first Latin artist to receive the Pied Piper, Julio joins past winners Frank Sinatra, Ella Fitzgerald and Barbara Streisand, among others. In addition, Miami Mayor Joe Carollo was on hand to declare "Julio Iglesias Day" in Miami. Miranda gave birth on April 3rd, 1999 to their second son. The baby, named Rodrigo, weighed 7 pounds 2 ounces. Two years later, on the first of May, she gave birth to two precious twin girls Victoria & Cristina. The mother of the artist, Rosario de la Cueva, who always helped the needy at the parish of Corpus Christi of Miami, passed away on March 14th, 2002 after a long illness. A month later, Julio and his brother Carlos presented a project for the construction of an assistance centre in memory of their mother. And on November 4th, that same year, the Rosario de la Cueva Assistance Center was opened, next to the parish of Corpus Christi, to serve the less fortunate people of Miami. On May 18th, 2004, when Julio was 61 years old, his second brother was born, Jaime Iglesias, the son of Dr. Iglesias and Ronna Keitt. Barely after announcing his second baby with Ronna, Dr. Iglesias Puga died suddenly the morning of December 19th, 2005, at the age of 90. A man of great vitality and friendliness, he was loved by all, especially by the press, who affectionately called him 'Papuchi'. On July 26th, 2006, Julio's little sister Ruth was born. Her father (Dr. Iglesias) would have turned 91 on that day. Julio continues his unstoppable triumphal march throughout the world. Every thirty seconds one of his songs is played on a radio station somewhere in the world. He performs in concert all over the universe, and his albums continue to be successful in sales. He spends his time among his houses in Punta Cana (Dominican Republic), Miami (United States) and Marbella (Spain), together with Miranda and their children. On May 5th, 2007, their fifth child, Guillermo was born in Miami. The baby weighed 8 pounds 7 ounces.